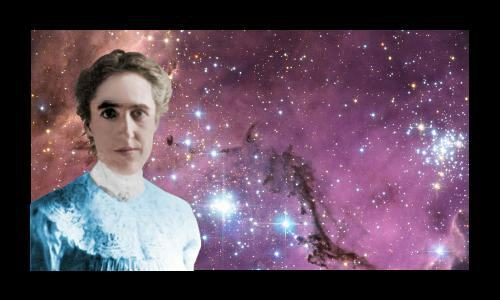 Henrietta Leavitt was an astronomer who opened the door to a dramatic enlargement in the size of the known universe. She found that a certain type of star, the Cepheid variable, pulses at a rate that’s related to its brightness. A Cepheid variable star’s pulse rate reveals the star’s true, fundamental brightness. The amount by which the star’s brightness is dimmed by distance allows the star’s distance from the earth to be calculated. Henrietta Swan Leavitt was born on July 4, 1868 in the town of Lancaster, Massachusetts, USA. Her father was George Roswell Leavitt, a doctor of divinity, who was a minister in the Congregational Church. Her mother was Henrietta Swan Kendrick. The Leavitt family was financially relatively prosperous. Henrietta was the eldest of seven children, two of whom died in infancy. Henrietta herself suffered ill-health for most of her 53 years. Her father’s church work kept the family on the move, and they spent several years in Cleveland, Ohio. In 1885, age 17, Henrietta enrolled at Ohio’s Oberlin College for a one year preparatory course. She then studied undergraduate courses for two years, spending a year studying music. The next move carried the family back to Massachusetts, to Cambridge, the home of Harvard University. At that time Harvard did not admit women, and Henrietta enrolled at the “Harvard Annex.” This was an educational establishment (now Radcliffe College) operated by the Society for the Collegiate Instruction for Women. Henrietta Leavitt graduated in 1892, age 23, with the equivalent of a Harvard Bachelor of Arts degree. Her degree credits included Mathematics and, in her final year, Astronomy. In fact, she enjoyed astronomy so much that, supported financially by her parents, she spent the next two years or so volunteering as a research assistant at Harvard’s observatory. During this time she began building up credits for an advanced degree in astronomy. Leavitt analyzed photographs of the heavens recording star brightness data. This was part of a Harvard project to catalog the position, color, and brightness of all the observable stars in the universe, which was then thought to consist of the Milky Way. Billions of other galaxies remained to be identified, and Leavitt’s future work would make this possible. 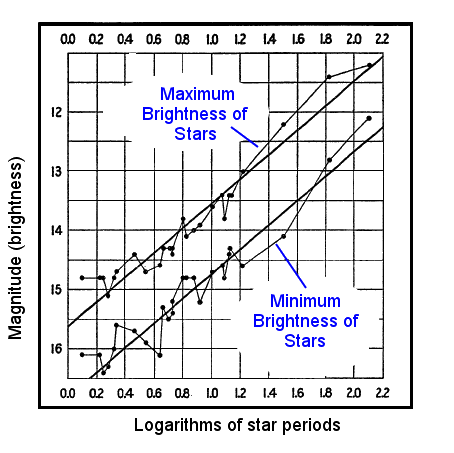 Leavitt was asked to take particular note of stars whose brightness varied, and the period of the variation – in other words how long it took a variable star to make a complete cycle from bright to dim to bright again: this might have been days, weeks, or months. 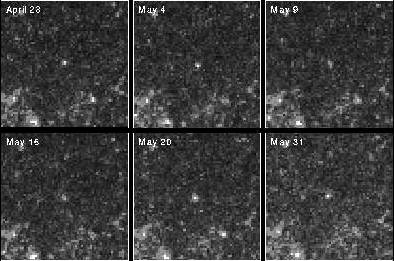 A sequence of six images showing a Cepheid variable star going through its bright-dim-bright cycle taking just over a month. Image courtesy of Hubble Space Telescope. The work Leavitt carried out needed a meticulous eye for detail plus the mental stamina to examine image after image for many consecutive days. She began writing a draft report about her work, but did not complete it. Leavitt spent 1896 and 1897 in Europe. On her return to America, she collected her draft variable stars report and traveled to Beloit, Wisconsin, where her father was now a pastor. There she got a job as an arts assistant at Beloit College, a liberal arts college. In May 1902, age 33, Leavitt contacted Harvard College Observatory’s director Edward Pickering requesting her laboratory notebooks be sent to Wisconsin so she could complete her long-abandoned report. She apologized for being out of touch for so long and said she’d had trouble with her eyes, which were now okay, and problems with her hearing, which were ongoing. She also asked if he knew where she could get a job at an observatory in a warm climate, because cold weather seemed to aggravate her hearing problems. Pickering replied saying he knew of no warm climate jobs, but he complimented her on her earlier work at Harvard, and invited her to return to the Harvard College Observatory to work full-time at a pay of 30 cents an hour. Although this sounds like a very low wage, it was actually higher than the average wage in America at the time, which was about $10 a week. School teachers earned less than $350 a year. Pickering employed about 80 women at the observatory as ‘computers,’ paying most of them 25 cents an hour. The women, all well-educated, carried out the time-consuming calculations and data analysis that are now performed by electronic computers. Leavitt began work at Harvard in the fall semester of 1902, then took a winter vacation to southern Europe and the Mediterranean Sea, before returning to her work as one of Pickering’s computers. Leavitt transformed the science of astronomy by dramatically extending the range at which a star’s distance from the earth could be measured. Her work was pivotal to Edwin Hubble’s discovery that the universe is much bigger than just the Milky Way and that our own galaxy is but one of many. In the second century BC, a genius by the name of Hipparchus managed to measure how far the moon is from the earth using a method called parallax. When you view something from a different location, it appears at a different place against the background. In this example, the different locations are your left eye versus your right eye. The moon shows a significant amount of parallax when viewed from Greece versus Egypt, allowing Hipparchus to make an excellent estimate of its distance. Many centuries later, after astronomers finally accepted the work of Copernicus and Kepler, they realized that the earth’s orbit around the sun offers the opportunity of using parallax points much farther apart than Egypt and Greece: while the distance from Athens to Alexandria is less than 4,000 km, the average earth-sun distance is 150 million km, a difference in scale of 37,500. However, some things are easier said than done, and it took until 1838 for any star’s distance from the earth to be measured, when Friedrich Bessel determined the distance to 61 Cygni. Such measurements require extreme precision, because even using the earth-sun orbit radius as the parallax base, the angles made with stars are tiny. For example, the parallax angle when determining the distance to the sun’s nearest neighboring star Proxima Centauri is about the same angle as the one subtended by a one cent coin viewed from a distance of about 3 miles (5 km). Utilizing parallax on even the closest stars requires accurate measurement of incredibly tiny angles. This means parallax can only be used to determine distances to a fraction of the stars observable with telescopes – those close enough for a parallax angle to be measured accurately. 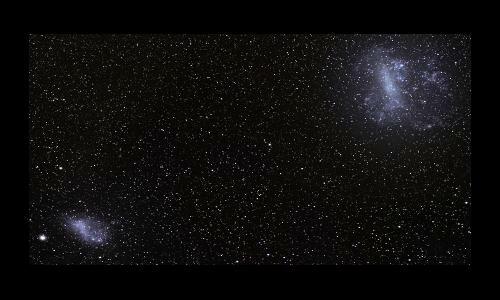 The Small and Large Magellanic Clouds – Image courtesy of ESA. Leavitt was astonished at the number of variable stars she discovered in these clouds – 969 in the small cloud and 808 in the large cloud, making a total of 1,777. These stars are classed as Cepheid variable stars, named for Delta Cephei in the constellation Cepheus. This first Cepheid variable star was discovered by John Goodricke in 1784. Here was a hint at something interesting. Leavitt continued with her painstaking analysis of variable stars in the following years. In 1912 she published her breakthrough. Making the assumption that all the Cepheids in the Small Magellanic Cloud lie at the same distance from the earth, Leavitt deduced that the fundamental brightness of a Cepheid is directly related to its pulse rate. This means that if two Cepheid stars have the same pulse rate but one is dimmer than the other, then we can tell that the dimmer one is farther from us. Since there is a precise relationship between distance and brightness – like gravity it is an inverse-square law – precise distances to all Cepheid stars were now within the grasp of astronomers. This was a momentous breakthrough. 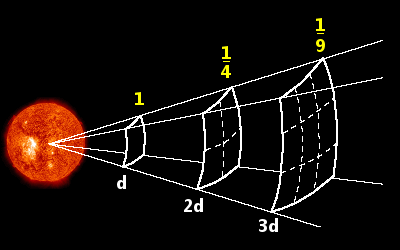 The inverse square law for light intensity: If you double your distance from a star, the amount of light reaching your new position in space is lowered by a factor of four. If you triple your distance, the amount of light you get is reduced by a factor of nine, etc. To utilize Leavitt’s discovery, the small number of Cepheids whose distances from Earth could be determined by parallax had to be studied. Astronomers now had what is often called a standard candle. They knew exactly how bright the candle must truly be, and could calculate how far away it was by the degree to which it was dimmed. Next, Edwin Hubble used Leavitt’s relationship between a Cepheid’s pulse rate and its brightness and Hertzsprung’s distance calibration to measure the distances to Cepheids located in a number of nebulae. He discovered that the Cepheids were so far distant that they were beyond the Milky Way; the nebulae were actually other galaxies and the universe was much bigger than anyone had realized. Hubble used Leavitt’s law to establish that the Andromeda Nebula is actually another galaxy. Image courtesy NASA/JPL. Leavitt’s work was pivotal to the development of astronomy, astrophysics, and cosmology. Magnus Gösta Mittag-Leffler of the Swedish Academy of Sciences tried to nominate her for the 1926 Nobel Prize in physics, but discovered that she was no longer alive. Nobel Prizes are not awarded posthumously. Leavitt was a quietly serious person, dedicated to her work, devoutly religious, and prone to ill-health. She became increasingly deaf as the years passed. She was made head of stellar photometry at the Harvard College Observatory in 1921, but did not live long enough to enjoy her new role. Henrietta Leavitt died, age 53, of stomach cancer on December 12, 1921 in Cambridge, Massachusetts, and was buried in the Cambridge Cemetery near her mother, father, and her two siblings who died in infancy. She had never married and had no children. "Henrietta Swan Leavitt." Famous Scientists. famousscientists.org. 10 Feb. 2017. Web.